We want to use this opportunity to tell you about one of the most important people serving at fond Blanc: Brother Theodore. Long before The Fond Blanc Foundation had a presence at the Fond Blanc Orphanage, and long before Alison moved to Fond Blanc, the children were being cared for by this very special man. “Fre Theo”, as he’s known around here, has been living at the Fond Blanc Orphanage for 5 years now. He was appointed by Pastor Jean Claude to come and oversee the children when the orphanage first opened its doors. At that time it was a small task with only 6 children here. But over the years the numbers have grown and today we have our hands full with a whopping 53 children under our care. Fre Theo will be the first to admit that the children give him more than a fair share of trouble, but as he looks back over the years, he recalls most of the stories with a gentle laugh. Fre Theo will tell you that he has grown to love these children and if anyone of them left, they would be greatly missed by him. Without a doubt this has been a huge task for Fre Theo. He has had help, of course, from Pastor Smail and many of the Mommies that come to help with laundry, cooking, and various tasks. But his post is of the upmost importance as he is responsible for all the children, staff, and facilities in Fond Blanc. Pastor Jean Claude always says that, without Fre Theo, he would have to close the doors to the orphanage. The sacrifices made by Fre Theo cannot be counted. For all five years that he’s been working here, he has done it out of the kindness of his heart, not taking a penny from anyone because he thought the children’s needs, like food and school books, were more important. He also must leave his wife behind in Port-au-Prince along with his 13 year old son. Theo gets to visit them sometimes, and they will occasionally visit here in Fond Blanc. Fre Theo talks about one day building a home for his family. But for now, this is where he is happy to serve the Lord. 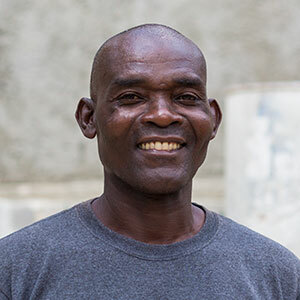 When you come to visit Fond Blanc you may see Fre Theo working hard to keep the orphanage grounds clean, secure, and looking beautiful for everyone. He also sells sodas to visiting friends with all proceeds going to help benefit the orphanage. But here are some things you might not know about him: He is a real animal lover, cares for our dog, Blackie; our kitten; and all the pigeons, ducks and chickens as well. You can see (and hear) him feeding the birds daily. And most importantly, he has a passion for the word of God. You can often spot Fre Theo under the shade of the mango tree, nose in the Word and praising God. So we are delighted to be able to tell you that, as a result of the Child Sponsorship Program that so many of you support,Fre Theo is finally receiving a salary! Naturally, this is something that he is thankful for, but it is clear to all of us who work with him, that the salary is definitely not what is keeping him here. We are happy and blessed to have such a respected, hard working, and loving leader to watch over this orphanage. Thank you, Fre Theo!